Description of "VAIRAGYA SHATKAM of king-sage Bhartrihari"
This is a rare and wonderful book of one hundred verses (‘Shatkam’) on the eclectic theme of ‘Vairagya’, which briefly means renunciation of and detachment from the gross material world, and overcoming its countless temptations. The book titled “Vairagya Shatkam of king-sage Bhartrihari” was written by a great and renowned king of ancient India who later on in life turned into an exemplary ascetic, known as a ‘Sanyasi’. His name was King Bhartrihari, and he ruled during the golden age of ancient India, during period 320 A.D.—544 A.D. Certain events in his life had such a profound impact upon him that he realized the impermanence of all joys of the material world, the trap of sensual pleasures, the hopelessness of expecting true happiness and peace in it, the transient nature of the world and the life itself, and therefore the futility of wasting time in pursuing them in the hope of obtaining abiding and true sense of happiness, peace and bliss through them. ‘Vairagya’ is a spiritual path that not only enables a person to attain freedom from the bondages, the pains, the grief, the torments and miseries that are associated with life in this mundane gross world, but also entitles him to obtain eternal happiness, joy, peace and bliss for his soul. This is the path adopted by true ascetics and self-realised persons. It leads them to liberation, deliverance, salvation and emancipation of their soul. It helps one to break free from the cycle of birth and death. This Book contains verse-by-verse Roman Transliteration that has the Diacritical mark as well as the Phonetics in English. This is followed by a detailed rendering in English that explains the text in the pattern of a commentary that is accompanied by notes when elaboration is needed. 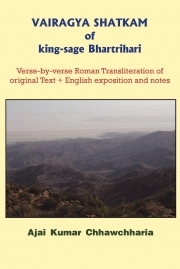 A Preface and a brief Life-Sketch of King Bhartrihari that precedes the main Text introduces the Book to the reader in a comprehensive manner. Reviews of "VAIRAGYA SHATKAM of king-sage Bhartrihari"